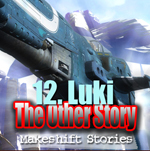 Luki -The Other Story is the first episode of an alternate storyline. At the end of episode 11 as the Sodality are about to leave Ceres three of their members accidentally discover an alternate means of escape. The trio is in turn rescued by an officious artificial intelligence. Mars: The Planets Suite licensed from Premiumbeat.